The current crop of support staff at Spark are by and large highly inefficient. I would not recommend anyone to consider moving to Spark now. 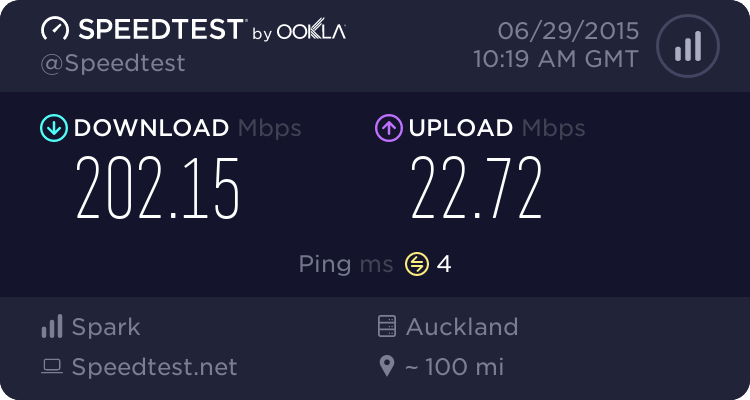 kiwitrc: I am looking at moving my business connection to Spark (on a business connection) but these latest posts do not enthrall me. Spark is a strong contender for home users (I'll be switching to them when we get UFB), but a business may be better suited to an ISP focussed on business customers, DTS have 100/100 for $119/month for example (unmetered national & unmetered up, 100GB international), and you'll never have to wait to speak to support there. Connected now at 200/20. However every 4 hours the connection will drop and then come back up after 10 seconds. This does actually affect gaming performance and everything disconnects which is VERY annoying. Am I the only one with this issue? I have already restarted the router. Thanks, had a couple recommendations for DTS. Done. Shout outs to Bartender for helping me get it sorted. What a legend. So last week I decided to upgrade my fibre 30/10 to the new 200/20 with voice plan, filled out the downer form and got an appointment for the 9th july for the chorus technician.I recieved the new business router yesterday morning and my internet stopped working before I could plug in my new router, called up spark and after troubleshooting for over an hour with the new and old router they said there is a fault in the line and they will sending a technician today to fix it. I called up today to follow up on that and they cannot seem to figure it out , getting transferred between departments and no one can tell me what is happening.I have been without internet for more than 24 hours now and they have now told me that they will investigate it further and get back to me within 2-3 days and my original appointment for the switchover for 9th july has been cancelled due to an "account conflict". I had similar issues after the changeover to the 200 MBPS connection. I have now reverted back to the 100 MBPS line and am getting speeds of around 85 MBPS which is far better than the 40 MBPS I was getting on the so-called 200 MBPS line. Also had lots of issues with this changeover! Did a change plan online from newly installed 30/10 (voice still on copper) a couple of months ago to 100/20 + VOF - but I never got sent to a Downers site. Many missed apointments from Spark/Downer. Eventually ended up rewiring things and called the IVR to port the number across myself. I guess my remaining issues are that I never got the free phone and am still on the old 100 Mbit router that I've had for over a year so am being capped at 94 Mbit instead of getting the 100. Can anyone on here help me please!? From what I've worked out from enquiring about this with mine and my parents move to FibreLL, the free phone offer only applied to new-to-Fibre installs (coming from DSL etc), as Spark didn't have to pay Chorus etc more for the copper integration work. It was assumed that anyone with an existing Fibre install on FibreLL launch had this integration done as standard, costing Spark more, so they didn't qualify for the free phone. GregV: From what I've worked out from enquiring about this with mine and my parents move to FibreLL, the free phone offer only applied to new-to-Fibre installs (coming from DSL etc), as Spark didn't have to pay Chorus etc more for the copper integration work. It was assumed that anyone with an existing Fibre install on FibreLL launch had this integration done as standard, costing Spark more, so they didn't qualify for the free phone. OK, thanks for that. My main issue is not getting the new Router.